Perchance Theatre at Cupids is located on the coast of Conception Bay on the island of Newfoundland. It is just over a 1-hour drive from St. John's along the scenic Baccalieu Trail. You may program your map system to 169 Burnt Head Loop, Cupids, NL A0A 2B0 and our latitude and longtitude coordinates are 47°33'48.16"N, 53°12'0.26"W.
Click here to go to the directions on Google Maps. 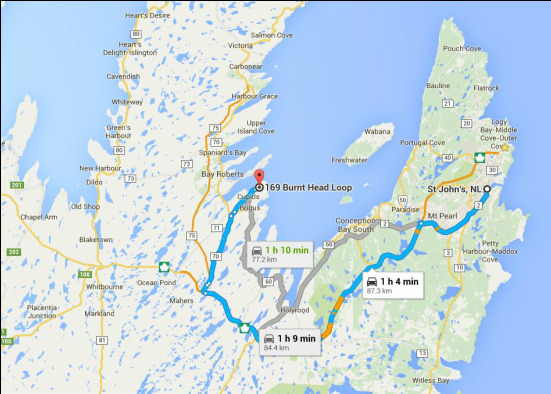 From the Trans Canada Highway (Route 1), take Exit 31 to Route 75. After 1/2km, exit to Route 70 and travel for 19km. At the top of the hill, turn right on to Goulds Ridge Road. Cross over Route 60 into Cupids onto Sea Forest Drive and travel for approximately 6km. At the fork in the road (Burnt Head Loop), stay to the right. Cupid’s Haven is the former church at the top of the hill, located at 169 Burnt Head Loop.